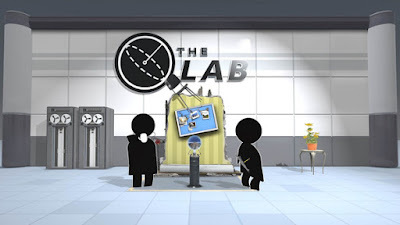 The Lab is the only game Valve has released for their own VR platform so far. It's a sampling of VR ideas tied together with a lab that looks like it's from the portal facility. The Lab has a bunch of mini experiences, some are just being in a space, some are more. There's a game where you grab a ship and move it around with your hand while it fires and dodges. One experience has you walking around a room scale model of the solar system. There's a robot repair room with ties to portal. There's all sorts of little things. If you get an HTC Vive then The Lab is the perfect place to start. It's easy to get comfortable in VR here and it doesn't ask too much of the player. The one standout for me is the Longbow game. It's an archery game where you're given a bow, infinite arrows, and put on top of a tower near a gate you need to defend. Stick figure men charge at it and you have to take them out. I started playing it like a game but quickly realized my real-life archery stance and skills applied. When I flipped over to that mindset I started getting headshots and it felt amazing. It felt like I was really earning my shots. After Hover Junkers and Audioshield, Longbow in The Lab is the other game I find myself coming back to very often.